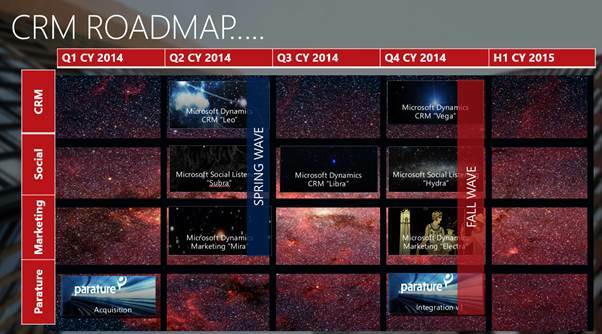 At convergence there were many announcements around the CRM road-map and upcoming Leo release. In this post I will summarise in a little more detail some of the great enhancements being made to Customer Care in the Q2 release. Note that the Q2 release will be available to Online and On Premise customers. Mobile – Android will be supported with a similar look and feel app as Windows and iPad. In addition the ability to reconfigure the org that it is working with will be provided. In addition the customer care entities will be supported across all platforms on the mobile app i.e. the case entity. This will enable mobilising the service desk. 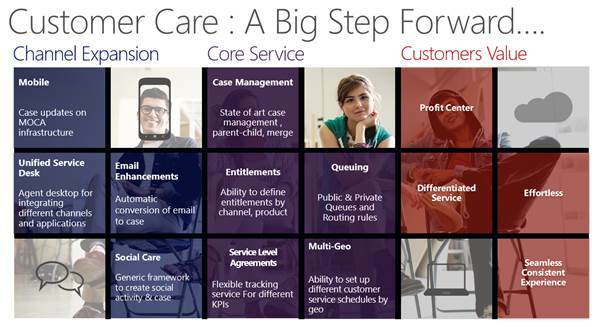 Unified Service Desk – This is a great new add and is similar to the Customer Care Framework. It provides a client side application that can be configured using standard records in CRM to connect to other systems in your ecosystem to provide a framework to enable pass through of context to other apps. In addition the ability to provide context sensitive call scripts will be provided natively and the ability to hook in a number of telephony provider add ons will be possible. This simple to use configure and deploy framework will make Enterprise contact centres a reality for Dynamics CRM. Case Hierarchies – Enables cases to be related to a root cause case with dependencies defined across them. SLA – SLAs will be configurable based on CRM data, i.e. can provide a different SLA for a Premium contract customer vs a Bronze, or based on severity of the case. 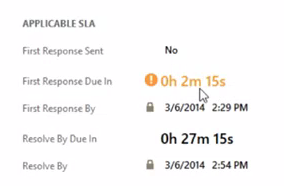 SLAs will control first response by and case resolved by timers. 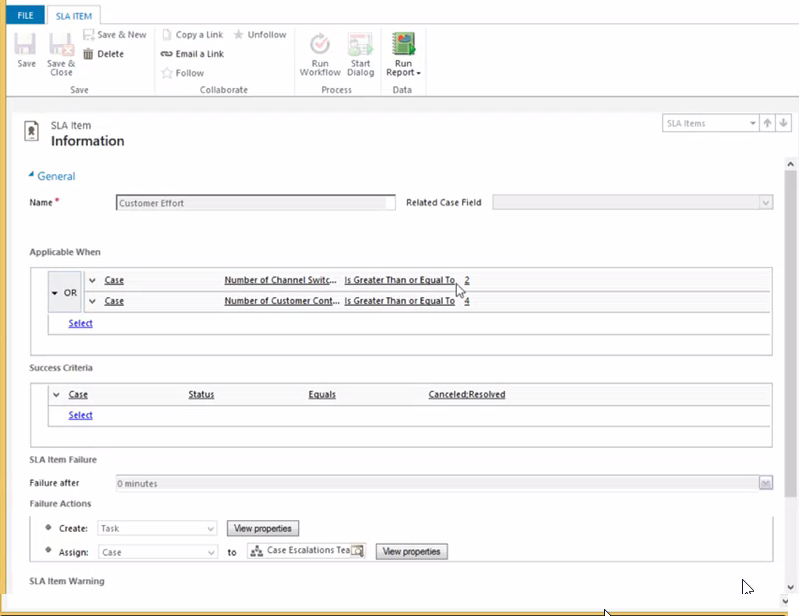 Workflow activities around escalation can be built into the SLA configuration to create tasks or emails etc, see below for an example where a task is created as part of the SLA failure state. Entitlements – ability to manage what products a customer is entitled to service on. Timers – Based on the Customer SLA, timers will countdown the resolution time and change colour when getting close to resolution time. These timers will be standard functionality and be tightly tied to the SLA module. Within the Unified Service Desk they can be exposed out on the KPI control. Life-cycle State Model, you will be able to define the status transition life-cycle without code i.e if the case status in waiting for customer you can not move it to Resolved unless first moved in back to in progress. Queues and Routing – ability to define memberships around queues, and define routing rules around channel management i.e. if an email comes in auto create case or route to a specific queue. These can be manually or automatically triggered. Social Care – the Dynamics Team will provide an example listening app that can be utilised to convert posts from twitter into Cases in CRM. Parature – future releases will see integration around web portals and knowledge base, likely Q4 release time-frame. I hope you liked the summary of new functionality coming in the Q2 Leo release. Microsoft Convergence 2014 was a truly amazing event with announcements left right and centre. This year’s event was held in Atlanta over 3 full day’s closing with keynote speakers Biz Stone and Arianna Huffington, and a the final celebration performed by FUN. At the core of the release is the Q2 spring release that includes major revamps to the Customer Care module of Dynamics CRM, the launch of Microsoft Dynamic Marketing (a standalone marketing tool with integration to Dynamics CRM) and finally the release the Microsoft Dynamics Social Listening. Quickly following will be an immediate update to the Social Listening component with a Q3 release of Libra that will extend the Social listening capability and integration to Dynamics CRM. The Q4 release will then be another huge release extending the capability further in each of the core products while for the first time integrating some of the great Parature features of Knowledge base and portals into Dynamics CRM. To be honest each release could be a blog in its own right and over the few days I will try and go into a little more detail on my dedicated Dynamics blog http://www.nakedcrm.com. So what I will do is set the scene for the Spring release and without going into lots of details about each release, here are the key takeaways. A key point to note on this release is that it will now be both an Online and On Premise release. The slide above depicts the core new capabilities being introduced with Leo around Customer Care. The highlights for me of this release are the ability to manage SLAs, the new Timer object to time cases, and the Unified Service Desk for developing composite framework environments. Not only are we seeing enhancements to customer care we will also see improvements around productivity including removal of the SharePoint iframe and replacement with a server side sync process, a new Android mobile app, Exchange online sync, and enhancements to Online migration and deployment tools for data. The Mira release will see a revamped Dynamics Marketing platform built upon Marketing Pilot. The look and feel will be identical to Dynamics CRM and the integration to CRM will include all core entities. 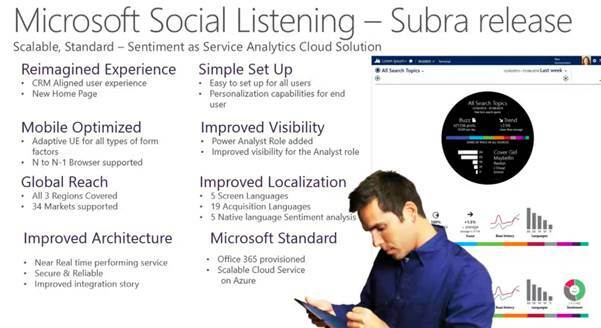 The Subra release will focus on delivering Social Listening capabilities directly in Dynamics CRM as well as a separate application for monitoring brand awareness, customers, contacts and listening to key words across all social media channels. With the Spring release will come a new licence offering around Enterprise customers that will include all capabilities while in addition providing individual access to Dynamics Marketing. The CRM professional licence will also be enhanced to include Dynamics Social Listening by default. As and when the pricing for our region is announced I will further post on this topic. 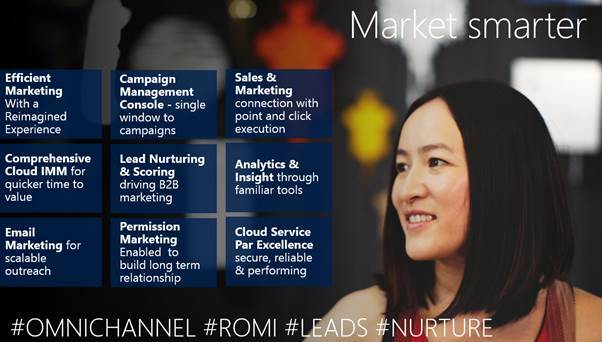 In summary, 2014 is going to be the year of Dynamics CRM. With the 8 releases we will see a truly enterprise CRM system that will deliver amazing experiences for Customers across the full spectrum of CRM use cases.